We had one foal by Tesign this year due to house repairs, yard cleanup and health reasons - he arrived January 13 out of Exs and Ohs. What a colt - winning the NDQHA Futurity Open Weanling Stallions - what a comeback we had since we hadn't had a foal in the ring since Mona (The Design At Last). Thank you to Jimmy Lee for doing such a great job. Sailin An Asset "Willow" had a bay stud colt on April 3rd-sire The Big Chex son of the Investor, full brother to The Big Investment. Sold! 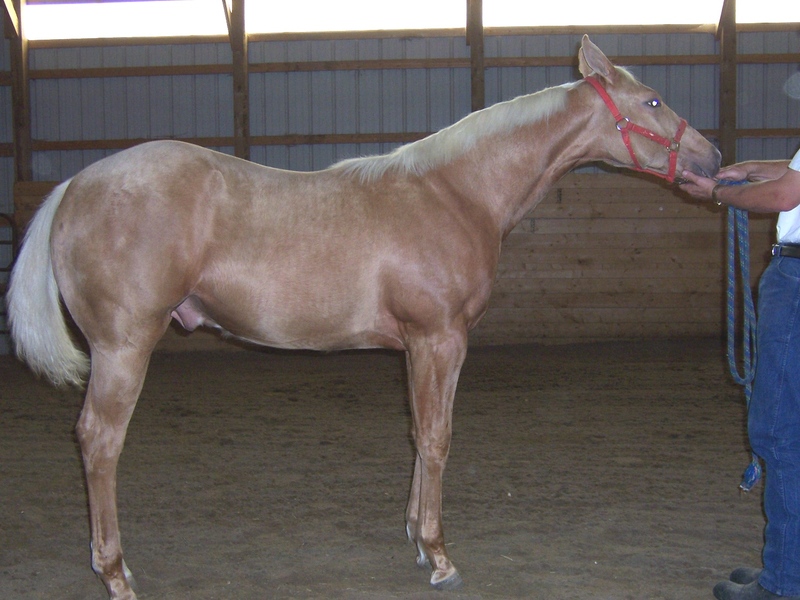 Granite Countess "Granite" had a sorrel stud colt by World Champion Design By Concention on March 1, this colt is Sold! 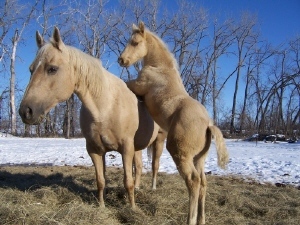 Ice wins best action shot in the cutest foal contest sponsored by Equine Legal Solutions http://www.equinelegalsolutions.com/index.html He also was in the American Quarter Horse America's Horse May 2007 issue with below picture. Ice out playing with mom! Open Futurity. September 14, 15 & 16, 2007. Three 1sts in Three Days! - thank you Jimmy & Audrey Lee from Warroad MN! MORE EXCITING NEWS!!! Ice wins the Red River Valley Select Sire Futurity October 20, 2007 - thanks again Jimmy & Audrey Lee, Warroad, MN for doing such a great job with Ice and foremost being the super people that you are! Ice wins ND State Fair as a yearling in July 2008, 4 shows, 4 grands also shows in September 2008, Verndale MN, winning all three shows, 2 grands and one reserve. 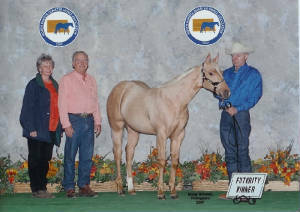 He wins the Red River Valley Select Sire Futurity Yearling Stallion Class. See picture under For Sale page.